Centipede grass requires perhaps the least amount of upkeep amongst the warm-season grasses. It will grow in nearly any type of soil, even sandy or clay soils with little fertilization or supplemental water. However, this hardy grass is slow to recover from damage. Consequently, centipede grass should not be kept too short or mowed too frequently, which stresses centipede grass and leaves it susceptible to infestation and disease. Fill in any valleys in your yard with quality top soil to make your lawn level. Sprinkle seed over the soil and pat it down with your hands. Keep the areas moist until the seed germinates, but mow as usual. Bumps and hills in your lawn cause your mower to scalp the grass and kill its roots. Centipede grass recovers slowly and these bald spots will persist unless the lawn is evened out. Set the height of your lawn mower blade so your centipede grass remains roughly 1 inch high between March and August. Mow the grass before it reaches above 1 1/2 inches in height. 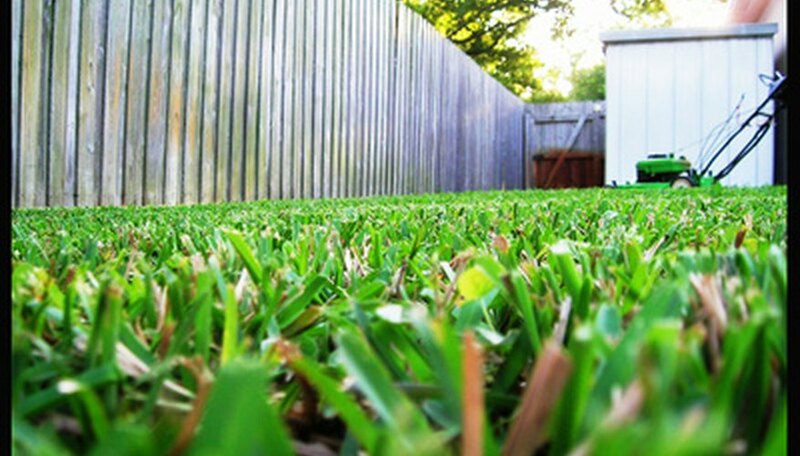 Never mow more than 1/3 of the grass' height at one time. Allow your centipede grass to grow to 1 1/2 inches a month or so before you expect your first frost. This longer grass height will allow it to better weather the winter. Remove any lawn debris in the winter when the lawn is dormant. Mowing is not necessary during this time. Cut the grass to 1 inch in height in spring when all threat of frost is gone. Rake up all of the leaf clippings if your lawnmower does not have a bag attached. If debris is left on the lawn, it contributes to thatch build-up, a common problem in centipede grass.